Modern Metal Gates. Works of Art. Everest Delivers on High-Quality and Style. Everest isn’t your ordinary gate repair company in Los Angeles; we also offer high-quality, affordable one-of-a-kind gates for residential or commercial properties. Our custom driveway gates Los Angeles team is comprised of artists who take pride in creating sublime gates of all types, using multiple mediums. All materials are hand-selected by the artist to ensure the highest quality. Do you have a budget for a custom gate? Everest will work with you to stay within that budget and create a stunning gate that will be the envy of the neighborhood. Want a polished concrete gate with an acid wash and a center inlaid oak panel with your initials cut into it and inlaid with marble? We can mix materials and create a complex design, or keep it clean and simple and compose a majestic iron gate or wooden master piece. Our team of skilled craftsmen make the best custom gates in LA, so share your design dreams with us, and let Everest weld, cut, and shape them into your reality. Electric gates for driveways Los Angeles are an essential part of the design of a home. Many choose to install one because they love the unique features added to their home or office. Functional features and visual are important in every design. Although many install a new gate for security and privacy, homeowners insist of a design that will compliment their home. What is a Custom Gate? If you have been looking for a wood gates Los Angeles company to create a custom driveway gate for your property, or if you want a modern metal sliding gate for your place of business, Everest delivers innovative gate designs and custom solutions to give your property that added security that makes a statement. Guard Dogs Help Protect Homes. For Enhanced Security Call Everest. We are the "Dobermans of Custom Gates" in LA. Our custom driveway gates Los Angeles artists love working with wood. It has a primeval semblance that beckons the Old World, yet it can be finished, treated, and implemented to create phenomenal modern and contemporary designs. Our custom wood gates are personally selected by one of our in-house artists. Any type of wood can be used to construct custom gates, and unless a customer specifies a specific species our Everest team chooses types of wood based on their strength, availability, durability, and cost. We also look for wood with a beautiful grain that will stand out after the wood has been stained and treated. Depending on the customer’s design requests, we are able to give wood a particular look. We have noticed that most custom wood gates in Los Angeles tend to have a modern style. Our craftsmen have completed several gates designed to accommodate modern homes in which the wood is stripped down to give it a clean, naked minimalist look. Some clients who own a horse ranch or a craftsman style home want a custom driveway gate with a rustic look. We can torch the wood to give it an aged feel. Our custom gate designers also beat the wood with chains to offer a wild, distressed vibe. All of our custom wood gates in LA are treated to kill off any parasites and to withstand the wrath of Mother Nature. Without treating the wood it could suffer damage from rain, hail, or strong wind blowing stones and other debris into it. Whether you desire a driveway gate made entirely of one wood species, an electric gate made from various types of wood, or a custom security gate that blends wood and metal together, give us a call and experience the highest quality custom gates for the lowest price in LA! Do You Have a Tired Dull Gate from a Big Box Store? It's Time to Switch Gears and Enjoy the Affordable Luxury of a Custom Gate. Each metal has its own unique qualities that gives it a characterized behavior based on light and temperature variations. Everest makes the best custom metal gates in Los Angeles because we design and build our driveway gates to compliment both your style and the properties in each type of metal. Our custom driveway gates Los Angeles artists work with copper on a regular basis. We make entire electric gates and swing gates out of copper, and we use it to create ornaments or sculptures that are integrated into the design. Our metal workers also conjure up copper gate hardware and valves. 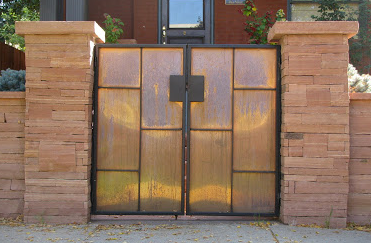 Copper is a very popular metal to accent gates with because it has the ability to change colors due to heat and moisture levels, and it can change color as it patinas. Copper is also a very versatile metal to work with, as there are many ways to color it. If your gate is going to be near a water feature or a sprinkling / misting system, there are ways our craftsmen can treat the copper so it will give off a rainbow effect. This is accomplished by using a variety of chemicals to trigger the right color spectrum, or by applying a torch flame. Copper gate hardware and entire gates made from this metal are always in style, as the metal easily accommodates a number of looks ranging from country to modern. If you want a custom copper gate our artists can come up with the ideal design to compliment your home and unique sense of style. Ever wonder why brass and bronze tend to look alike? Take some copper, add zinc to it, and you get brass. Bronze, on the other hand, is a hybrid of copper and tin. Both metals share a same parent. 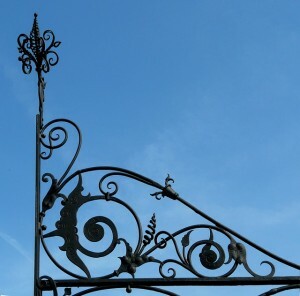 If you like the look of these metals, and you want detailed accents on your custom metal gate, such as a peacock feather design, our experts at Everest recommend bronze because its alloys expand very slightly prior to setting allowing the finest points in a mold to capture the metal in striking, vivid detail. Working with bronze requires highly skilled craftsmen. Processing the casting requires a distinct set of skills, including the knowledge of creating and handling wax casting. Some methods rely on centrifugal casting, as well as sand casting. These are skills our craftsmen learned from taking technical courses that are seldom seen in most curriculums, so finding a custom driveway gates Los Angeles company capable of producing such high-quality work can be a real challenge. Brass gates require a lot of care, as the metal must be treated with a protective finish in order to protect the color quality. However, like its parent copper, brass can naturally develop patinas over time that darken with age. Most gates only use accents of brass, such as brass knockers to lend to that old world feel. Did you know that iron is regarded as the tenth most common element in the universe? Steel is a close relative of iron because because it is its best known alloy. Men have been manipulating iron for thousands of years. Medieval swords were hand-made from steel, and our custom gates Los Angeles metal workers like to think of themselves as modern-day knights who are masters at working steel to safeguard families through the craft of making the strongest drive way gates at the lowest prices. First of all, steel is not that easy to find. Acquiring lumber is easy because you can take a jaunt on down to any lumberyard. However, steelyards are scarce and usually only found in industrial parks because, let’s face it, the general public isn’t hot to go buy 30′ piece of 6/0” diameter A36 steel rod. We have trained metal workers with a background in blacksmithing, a massive forge, and a wide variety of tongs to handle different shapes of metals. Whether you want a contemporary iron gate with your initials welded into the center, or a gothic-influenced that looks like its straight out of the Dark Ages, our Everest team makes superior quality custom iron and steel gates in LA at the lowest prices. Steel is a good option to fortify a property through the construction of a custom metal gate because of its durability. After all, Superman was called “The Man of Steel” for a reason. When it comes to custom gates Los Angeles companies that use a variety of metals to make custom driveway gates, Everest stands out proud because we take common metals and use innovative techniques to give a custom look rarely seen. For example, we can prematurely patina the steel and then apply linseed oil and turpentine giving the surface a dazzling sheen that looks like fresh leather. Just be aware that opting for a steel gate with this treatment will require continuous treatment with oils every few months to maintain the look. You will also want to avoid using steel if your gate will be near a water source, as steel rusts very easily. What is the Most Affordable Custom Driveway Gates Los Angeles Company? Everest doesn’t just make premium quality driveway gates of all types from any material, we also offer the lowest prices in all of LA. Not all luxurious things should come with multiple dollar-sign price tags. Our electric gates, swing gates, and commercial gates are constructed using the finest materials, but we source them from a supplier at near-cost making it possible for us to pass the savings on to our customers. Your home is your castle. Don’t you deserve a hand-made protective barrier from a custom driveway gates Los Angeles company designed to safeguard all the important people on the other side of the fence?